Kimiyo Hayashi 林公代 ‏ @payapima 20:05 - 2 окт. 2018 г. Engineers at DLR’s lander control center in Cologne, Germany, have confirmed the MASCOT robot separated from Hayabusa 2 as intended. The lander’s science instruments have all been activated, and the the craft’s magnetometer detected a change in orientation, indicated MASCOT was tumbling toward asteroid Ryugu as designed, according to Ralf Jaumann, the lander’s principal investigator at DLR. Scientists celebrated the moment they received confirmation that MASCOT was safely away from Hayabusa 2. Data arrived in the control center verifying MASCOT’s deployment at 0218 GMT (10:18 p.m. EDT), nearly 20 minutes after the lander’s release. 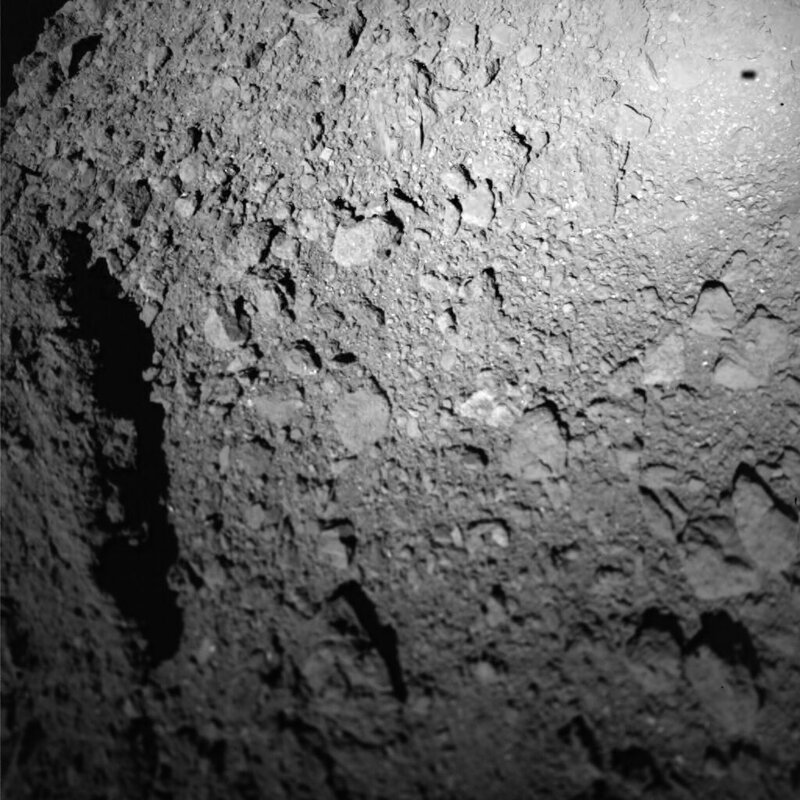 More data from MASCOT is not expected to be transmitted back to Earth for at least a few hours, while Hayabusa 2 — which acts as a signal relay between the lander and Earth — climbs to a position 3 kilometers (1.9 miles) from the asteroid. HAYABUSA2@JAXA‏ @haya2e_jaxa 20:21 - 2 окт. 2018 г. 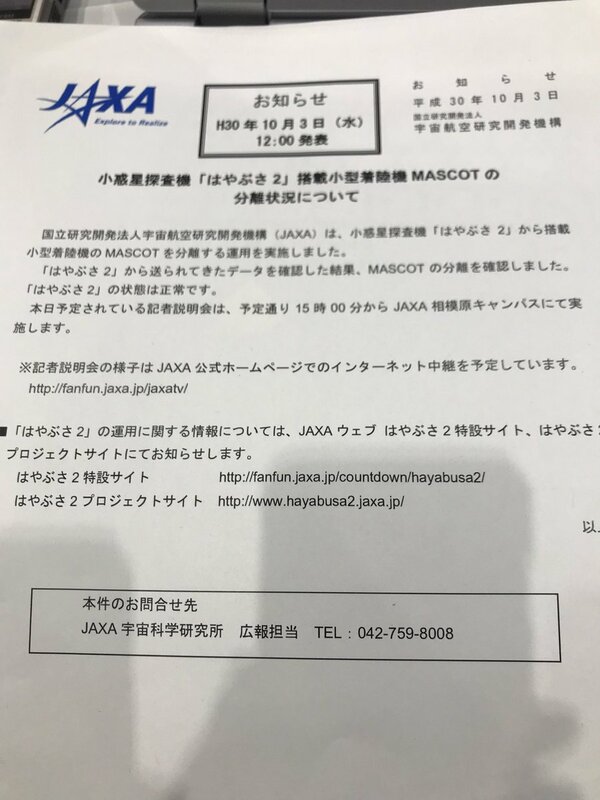 [MASCOT] 2018/10/03 at 11:17 JST: After checking the data sent from Hayabusa2, we can confirm that the MASCOT separated from the spacecraft as planned. Hayabusa2 is now ascending and the state of the spacecraft is normal. Spaceflight Now‏ @SpaceflightNow 20:26 - 2 окт. 2018 г. 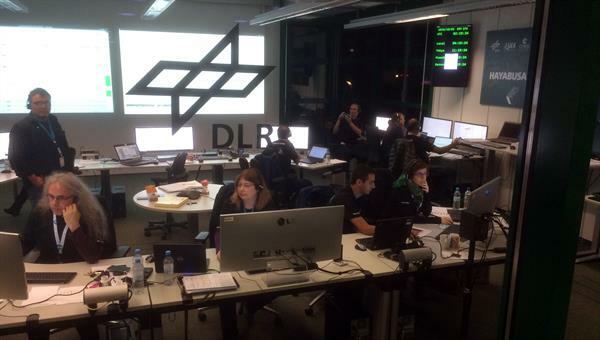 We were in the MASCOT control center in Cologne, Germany, as scientists confirmed the lander’s separation from Hayabusa 2 less than 200 feet (60 meters) from asteroid Ryugu. No further data from the lander is expected in the next few hours. DLR - English‏Подлинная учетная запись @DLR_en 20:32 - 2 окт. 2018 г. Confirmed! @MASCOT2018 has separated from #Hayabusa2 and is on its way to asteroid Ryugu! Confirmation received at 4:17 CEST. All is nominal! DLR has revised the time the first signal confirming MASCOT’s separation from Hayabusa 2 arrived in Earth to 0217 GMT (10:17 p.m. EDT). MASCOT Lander‏Подлинная учетная запись @MASCOT2018 20:45 - 2 окт. 2018 г.
I’m doing it! I’m descending to #Ryugu! Can’t stop me now! [MASCOT] 2018/10/03 at 12:18 JST: Communication with MASCOT has been confirmed. The separation altitude was about 51m and the separation time (at the spacecraft) was 1:57 UTC. ТОКИО, 3 октября. /ТАСС/. Робот-исследователь MASCOT в среду успешно отстыковался от японского зонда "Хаябуса-2", который находится возле астероида Рюгу в 280 млн км от Земли, и отправился к этому космическому телу, чтобы совершить на него посадку. Об этом сообщило Japan Aerospace Exploration Agency (JAXA). The MASCOT asteroid lander is controlled from the Lander Control Centre in Cologne. Ground teams here in Cologne, Germany, have now confirmed that the MASCOT robot has successfully reached the surface of asteroid Ryugu. "It could not have gone better," said Tra-Mi Ho from the DLR Institute of Space Systems, MASCOT’s project manager. "From the lander's telemetry, we were able to see that it separated from the mothercraft, and made contact with the asteroid surface approximately 20 minutes later." The robot is now conducting a pre-programmed, automated science sequence with its four instruments. Scientists have already confirmed MASCOT’s camera has captured images following separation from Hayabusa 2 a few hours ago. Those images have been transmitted back to Hayabusa 2, which will relay telemetry and data between the lander and Earth. 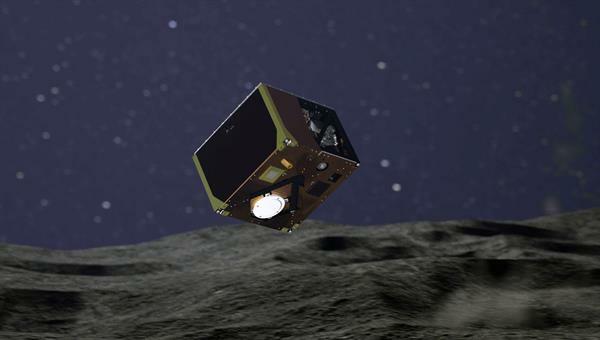 After its release fr om Hayabusa2 today just before 04:00 and a short free-fall descent at an estimated speed of 15 cm/s, MASCOT (Mobile Asteroid surface SCOuT) successfully landed at the MA-9 site in the southern hemisphere of asteroid Ryugu, after bouncing several times on the particularly inhospitable surface that is strewn with rocks (according to pictures taken by Hayabusa2’s camera from an altitude of 6 kilometres) and wh ere temperatures are not yet known. Hello #Earth, hello @haya2kun! I promised to send you some pictures of #Ryugu so here’s a shot I took during my descent. Can you spot my shadow? [MASCOT] October 3 at 15:47 JST: the Hayabusa2 spacecraft has been confirmed to have shifted to the hovering phase as planned. Currently, the spacecraft is hovering at an altitude of about 2.5km. ... Можете ли вы увидеть тень MASCOT в правом верхнем углу? MASCOT's ground team had to command the lander to use its internal swing arm mechanism to hop a short distance earlier than planned to ensure the probe's instruments were properly pointed, officials said. "MASCOT is fine," said Tra-Mi Ho, the project manager at the German space agency, DLR. "Unfortunately, at the beginning it had a bit of a problem. We were landing in an unfavorable orientation. "We solved the problem," she continued in a briefing a few minutes ago. "We have relocated a little bit earlier than we planned, and now MASCOT is on the second side." The lander's lifetime is finite, and is expected to last around 16 hours from its initial landing, putting the likely end of the mission around 1800 GMT (2 p.m. EDT). The spacecraft on the surface of Ryugu is currently in its second night. The asteroid rotates once every 7.6 hours, and MASCOT is battery-powered, so it can continue science data-gathering in sunlight and darkness. Its cameras carry four LED lights -- three in visible wavelengths and one in infrared -- to illuminate nearby rocks to take pictures at night. MASCOT is radioing its imagery and data up to the Japanese Hayabusa 2 spacecraft, which dropped it off just above the asteroid shortly before 0200 GMT (10 p.m. EDT) overnight. Hayabusa 2 will store the information and transmit it back to Earth in the coming days. "The main challenge is that we would like to upload all the data which we have acquired," Ho said. [MASCOT] October 3 at 20:30 JST: MASCOT operation is ongoing. The spacecraft is hovering at an altitude less than 3km. Calm has returned to the Hayabusa2 control room. Небольшой андроид совместной разработки ученых из Франции и Германии имеет кубическую форму с гранью 30 см и весит около 10 кг. И днём и ночью кот - учёный! ТОКИО, 3 октября. /ТАСС/. Новый робот-исследователь MASCOT, отсоединившийся ранее от японского зонда "Хаябуса-2" ("Сокол-2" ), совершил успешную посадку на астероид Рюгу в 280 млн км от Земли. Об этом сообщило в среду Японское агентство аэрокосмических исследований (JAXA).